A pro forma invoice, also known as an estimate or quote, is essentially a preliminary bill of sale. It outlines a seller’s intent to deliver products or services to customers, for a specific price. As the price hasn’t been agreed yet, it isn’t a true invoice. Why use pro forma invoices? Pro forma invoices streamline the sales process. Your customer agrees to the price on the pro forma invoice, and then you deliver the goods. There’s no back and forth after you’ve fulfilled your end of the bargain as it’s all agreed up front. They’re ideal if you don’t have all the details for a commercial invoice – for example, before the goods are delivered. As an extension of this, pro forma invoices are usually sent to declare the value of goods for customs for a smooth delivery process. They’re not a payment demand or request. Pro forma invoices are ‘good faith’ agreement so your customer knows what to expect. Some businesses request pro forma invoices for their internal purchasing approval process. Issue your pro forma invoice to the customer. Once it’s accepted, convert the pro forma invoice into a commercial invoice with one click. This works just as easily for multiple quotes. Every time a client agrees to your terms, just click and button and the system will copy all the data into a final commercial invoice for you to issue. That’s great if you’re working on lots of projects at once. Note: only after a pro forma invoice is converted into a true invoice will its value be registered in your account. This is because, until that point, there is no guarantee the customer will agree to your terms. Want to get all the benefits of pro forma invoices? Start a free trial of KashFlow today. In the past, business owners would traditionally issue a quote and then have to produce an invoice once the customer had agreed to the terms laid out. However, KashFlow streamlines this process – once a customer has agreed to the prices set out in the proforma invoice, it can be converted to a ‘true’ invoice with just one click. This is particularly useful if you’re in, say, the service industry and issue lots of quotes to potential clients for project-based work – every time a new client agrees to your terms just click a button and it takes mere seconds for the system to copy over all that data into an invoice. Only after a proforma invoice is converted to a true invoice will its value be registered in your accounts; this is because, until that point, there is no guarantee that the customer will agree to your terms. Creating a quote works much the same way as creating an invoice, but you can also mark quotes with flags to reflect what stage of the discussion you’re at (e.g. draft, in negotiation, awaiting review etc). 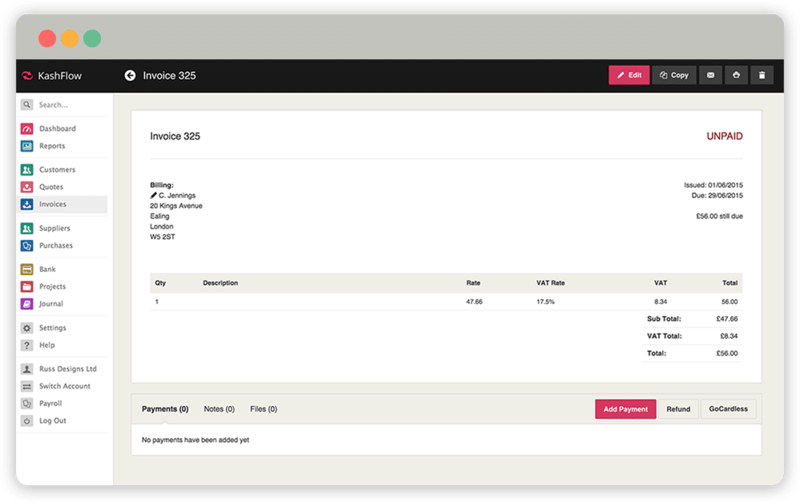 Just like with invoices, KashFlow allows you to create custom proforma invoice templates to issue to potential customers – having a professional looking template ready to go will help you save time and make issuing quotes to lots of potential new clients a snap!